Fans watch the Chattanooga Lookouts game at AT&T Stadium in Chattanooga. Lookouts owners say they are ready to begin talks with officials about constructing a new stadium on the 141-acre site of the former U.S. Pipe/Wheland Foundry located in the South Broad District. Chattanooga Lookouts owners say they're ready to talk with public officials, South Broad District landholders and others after a report this week suggested a multi-use ballpark for the area. "It's something we're interested in," said Jason Freier, the Lookouts' operating partner. "In the wake of this report, it seems to be appropriate to examine that." Also, the owners of the 141-acre U.S. Pipe/Wheland Foundry site located within the district, too, said the timing is right to pursue a possible new sports and entertainment venue. Staff file photo by Doug Strickland / Chattanooga Design Studio Executive Director Eric Myers walks into the old U.S. Pipe foundry. A new report by the studio lays out a vision for the foundry and the South Broad District. An open house to review the South Broad District study will be held Monday from 5-6:30 p.m. in the first floor meeting room of the Development Resource Center, 1250 Market St.
"Absolutely," said Mike Mallen, part of the foundry ownership group. "If we could have a small version of what the Atlanta Braves have done, a small SunTrust Park, it would be great." Mallen added that the tract already qualifies for brownfield tax-increment financing (TIF), a tool that could be used to help spur development in the area. In TIF districts, the city and county use increases in taxes generated by new development to repay investments in streets, parks and other such improvements. Mallen said the next step is to work with Lookouts owners and come up with "a budget proforma" and a development plan, and to involve the city and Hamilton County. The 128-page South Broad report was issued after a series of public meetings last fall that drew several hundred people to envision that area's future. The site is roughly a 10-square-block area bounded by the foundry land, The Howard School, Interstate-24 and Chattanooga Creek. 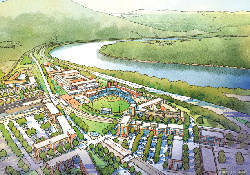 The Chattanooga Design Studio report foresees an array of new housing along with commercial and retail space, upgraded parks, streets, sidewalks and other infrastructure, including a new minor league ballpark and entertainment facility to serve as a catalyst for development. Freier said a lot of different pieces have to come together. "Conceptionally, there's a good chance for a project similar to what we've done in other cities and in cities we're not involved in," said the Lookouts official whose group has raised ballparks in Fort Wayne, Ind., and Columbia, S.C. Since a modern ballpark was built in Fort Wayne about a decade ago, more than $300 million in development has gone up around the $31.6 million facility, Freier said. Another $300 million-plus of projects are in some stage of development, he said. Freier has said the site isn't just a baseball stadium but a 365-days-a-year venue holding concerts, high school football and soccer and other events. People are conducting upwards of 600 events a year, he said. 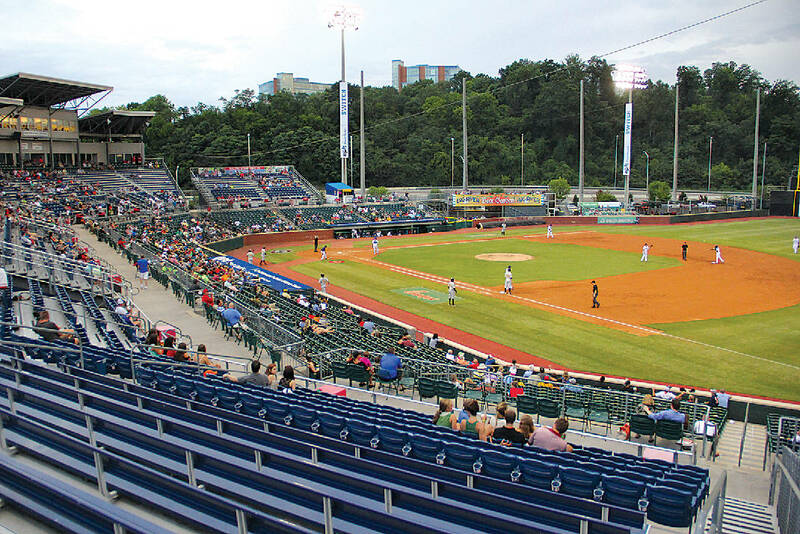 The current AT&T Field in downtown Chattanooga's riverfront, built nearly 20 years ago, wasn't designed or constructed to the standards of today's stadiums, according to Freier. Costing about $9 million and built by former Lookouts owner Frank Burke, it has become a dated ballpark earlier than others raised at the same time because of the way it was designed and the amount of money used to construct it, he said. Freier said that what the Lookouts group and others have done to drive their projects has been forming "public-private partnerships." "In each of these instances, the partnership involved multiple parties," he said. Mike Harrell, president of the South Broad Redevelopment Group, said he's "very excited" about the report's recommendations not just related to the ballpark but the entire area. He said the South Broad District "has been overlooked and neglected for a long time." Harrell said the South Broad group, which has long worked to promote the area, would be glad to host a public meeting over the stadium and tax-increment financing. "I don't think it's well understood," he said about such financing. The report said the city could set up a TIF district to use added taxes spurred by development in the area to pay for public improvements. County Mayor Jim Coppinger said he'd have to see if a TIF would benefit taxpayers. "We're always looking at how it would benefit taxpayers," he said, adding that he hasn't seen any request for a TIF. Coppinger said there have been talks about the Lookouts owners wanting to move from the current location to the South Broad District. "But there's nothing concrete and there's nothing about any kind of tax abatement," he said. Chattanooga Mayor Andy Berke did not return a call for comment. But earlier this week, the City Council agreed to let Berke execute a TIF related to extending M.L. King Boulevard across Riverfront Parkway to the Tennessee Riverwalk. However, the Nashville-based Beacon Center of Tennessee, a free-market conservative think tank, is pushing for a public referendum on any tax assistance for a new Lookouts stadium. "Despite the overly optimistic predictions that never seem to live up to reality, we believe it is not the proper role of government to take taxpayer money and hand it over to wealthy sports team owners," said Beacon Center President Justin Owen. Mallen said independent consultants say stadiums such as those that the Lookouts owners and others have done can spur 1.1 million square feet of new development. "This [U.S. Pipe/Wheland] property is barely on the tax rolls," he said. "Right now, all that's collected in taxes is just crickets. There's not anything there." Mallen said that bringing an array of new development to the site, "it's obviously meaningful." He said he and his partners have been patient about redeveloping the property, adding they want it to be "a legacy feature."